Compared with ten years ago, the vehicle and pedestrian flow are soaring on road. After all, the city has been through earthshaking changes. Although every city has delicately designed and improved its roads, the rate of traffic accidents is increasing with each passing day. At this extremely urgent moment, Fosjoas intelligent self-balancing scooters come into being. They are savior of personal safety on road and also relieve the traffic pressure. Therefore, they represent the mainstream of future travel. Generally speaking, Fosjoas electric scooters are able to cover all of travel needs from people. Here are many living examples. Many young people can ride Fosjoas electric scooters to go to work. Female prefers to ride Fosjoas K3 sitting-posture scooter, which offers safe and comfortable riding experience. Fosjoas V9 two-wheeled electric scooter is widely chosen by many successful talents. Active boys would like to ride Fosjoas twin-wheeled scooter or single-wheeled scooter to go to work or just weave on road. Besides, these two scooter types are quite popular in university campus. Fosjoas K2 and K5 electric scooters are often used for long-distance travel on weekends or on holiday. All in all, people always can find a suitable Fosjoas electric scooter for their own. Now that Fosjoas intelligent electric scooters can cover all of travel needs of people, here is another question: why can it ensure personal safety and relieve traffic pressure. All of Fosjoas electric scooters are very easy to control. Besides K2 and K5, other scooters are controlled by riders’ body. Riders can realize all controls, like speeding up, slowing down and changing direction, via leaning body forward or backward and turning body left or right. People can start or stop anywhere and anytime. The auxiliary brake system of K2 and K5 fully ensures riding safety. 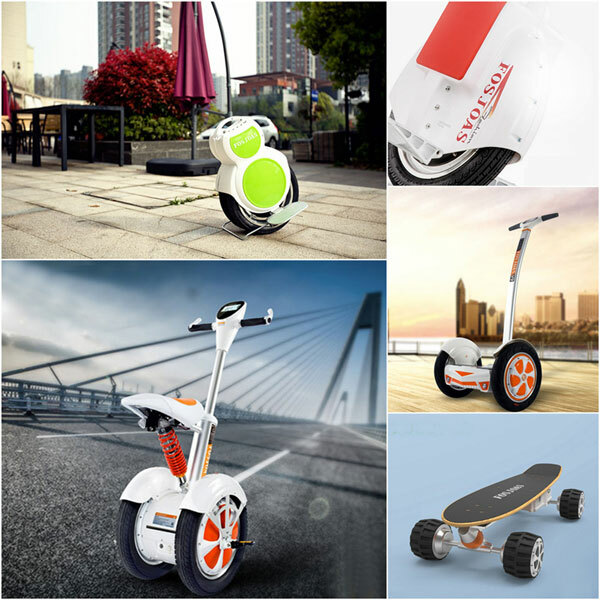 In addition, all of Fosjoas intelligent self-balancing scooters are much smaller and thus can weave among crowds freely.